The Alienware Graphics Amplifier unleashes stunning, graphics-intensive 4K and virtual reality games on notebooks and small form factors. Let true power transform you. Fuel meets fire: Supercharge gaming with the Alienware Graphics Amplifier. Simply plug in and enjoy a premium desktop experience with VR, immersive 4K graphics and big performance. Evolve in tandem: The Alienware Graphics Amplifier was designed with the future in mind. Easily upgrade your graphics cards with this accessible design – with support for full-length, double-wide, PCI-Express x16 graphics cards – so you can take advantage of the graphics performance increase without having to upgrade your entire system. For years, gamers have been forced to compromise. They could choose a notebook for prioritized mobility, but miss out on some of the performance and graphics experience only a gaming desktop can provide. Alternatively, they could enjoy truly intense at-home play, but stay chained to the desk. Finally, we have a means to deliver desktop-class, high-performance gaming graphics even to our most mobile laptop. Full Force: The Graphics Amplifier includes a 460 Watts internal power supply so you can run advanced graphics cards confidently. 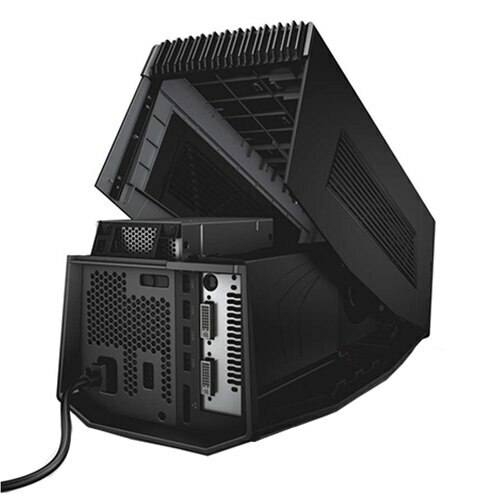 It’s designed with a single cord (6ft) that connects exclusively to the Alienware 13, 15, 17, and m15 notebooks, Alpha R2 and X51 R3. Limitless Power: With the Graphics Amplifier, you can power as many additional screens as the graphics card within it can support. 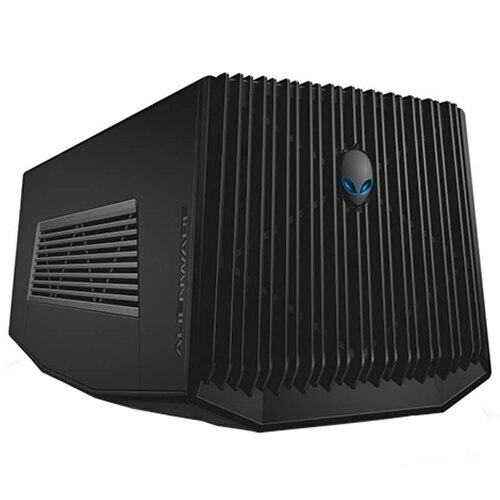 The performance from the Alienware Graphics Amplifier will be used on whichever screens the game or 3D application is running on. Engage your senses: Set triggers, morph lights from one color to the next, and make your system glow and blink in tandem with the game – all made possible with ability to customize your lighting theme via Alienware Command Center. Alienware Graphics Amplifier frequently asked questions. Does this come with a GPU? Which GPUs are qualified and which graphics cards are compatible? We provide deeper backwards compatibility for available GPUs compared to TBT3 options and offer support for a single full-length, dual-wide, PCI-Express x16 graphics card. This system can support graphic cards of up to 375W and NVIDIA® GeForce® RTX 2080 Ti as well as AMD Radeon RX series and newer. What is the difference between PCI Express Gen3X4 lanes and Intel Thunderbolt 3 Plug and Play? 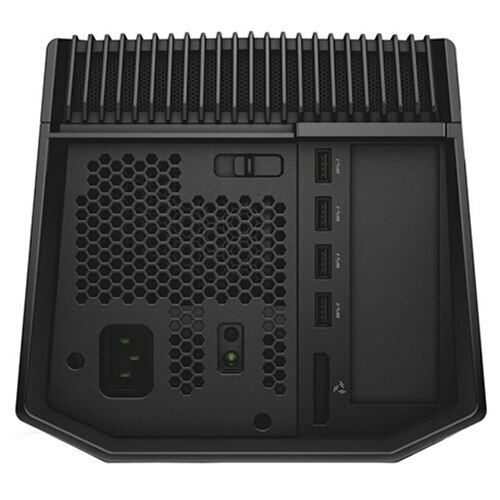 The Alienware Graphics Amplifier’s technology uses a direct hardware connection, while the Thunderbolt 3 technology is based on a platform with shared bandwidth. Alienware’s Graphics Amplifier will never share, or compromise, the bandwidth to your system’s GPU. Instead, it provides reserved high bandwidth directly to your system’s GPU with one unique cable connection. 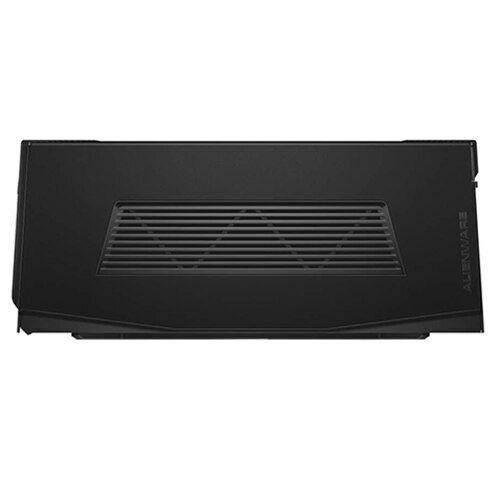 Alienware Graphics Amplifier utilizes four lanes of dedicated PCIe Gen 3. The Thunderbolt 3 specification is capable of either two or four lanes of PCIe depending on the OEM’s implementation of Intel’s technology. Alienware gains an advantage by having these lanes dedicated to graphics that are not shared by LAN, USB or display ports. 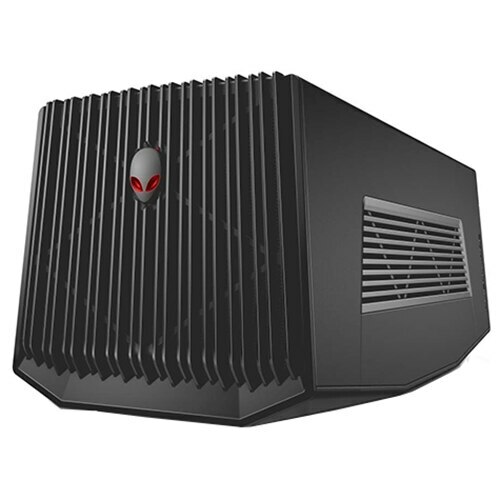 Can you run Virtual Reality through the Alienware Graphics Amplifier? RETURNS POLICY: Dell’s “Returns Policy” found at //www.dell.com.sg/applies to all sales. Choose carefully, as order cancellation rights are limited and additional costs may apply. COMPLETECOVER: CompleteCover service is available for personal computers, Axim PDAs, Dell branded projectors and LCD TV. CompleteCover excludes theft, loss, and damage due to fire, intentional damage, acts of God or natural disasters, animals, pets or pests. Customer may be required to return unit to Dell.This service is only available in selected countries.